ASTM D130-94, IP 154/93. SubCom D02.05. 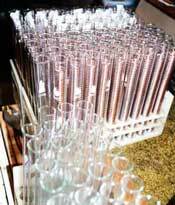 Detection of copper corrosion from Petroleum Products by the Copper Strip Tarnish Test. ASTM D1838-91 SubCom D02.H. Copper Strip Corrosion by Liquefied Petroleum (LP) Gases. ASTM D665 or NACE Rust Test coupons. Orders shipped by United Parcel Services (unless otherwise directed) from Tulsa, OK. Please view our Shipping Information page for more details. Please visit the C&P Catalyst Shipping and Pricing page.